Today’s parents are seeking ways to simplify their lives while raising a healthy, well-rounded child. Baby Led Weaning is a feeding process that fits every lifestyle; it is an amazingly intuitive and completely natural method of introducing your milk-fed baby to solid foods. This is also an eco-friendly method of feeding as it eschews packaged food and encourages the whole family to partake in whole, healthy foods. 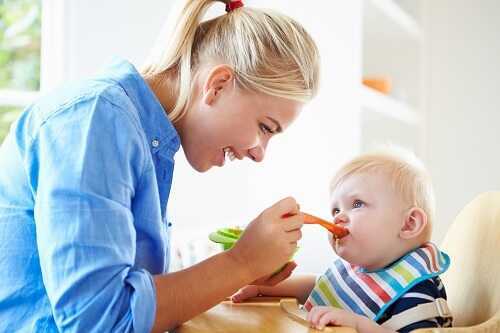 Baby Led Weaning is typically practiced by parents who have successfully breastfed or formula fed their baby until 6 months without introducing any solids. At six months, experts say the gut and digestive tract are mature and able to handle whole, healthy foods. With Baby Led Weaning, no cereal or purees are introduced. Parents of babies who are six months or older will need just a few key items to begin introducing solids. The items are: a bib or a baby stripped down to just a diaper, a flat surface like a high chair tray, and a cut up portion of a whole food. Bananas and avocados are perfect examples of ideal first foods. The food is sliced into pieces roughly the size and width of an adult finger. Babies at 6-8 months have not developed excellent pincer grasp skills yet, so the size of the food must be adequate for a small fist to grasp with enough food still visible outside of the fist to experiment with taste. The process will be a mess, but it will be fun for both baby and parents. A fourth necessity in this process is a camera as the bewildered, wide-eyed first taste of a whole food must be captured on film. As the tasting process begins, a baby will likely not consume much food. This is not a problem, as a baby who has thus far been milk fed only will thrive on the nutrients of his breast milk or formula. Solids foods are just for practice until the child turns a year old. It is ideal for parents to maintain a healthy diet so they can share their food at meals with their child. Processed food, red meats, and foods high in sugar are not healthy for a baby but neither are they for adults so these items should be limited in the family’s diet. The baby can share fruits, vegetables, and eventually dairy, poultry, and grains. The child continues to be nursed or formula fed throughout the introduction of solid foods and until at least one year. The World Health Organization recommends children be breastfed until at least age 2, and Baby Led Weaning lends itself perfectly to this recommendation. Baby Led Weaning leads to a healthy baby and a nutrient rich, low fat diet for the baby’s family which all leads to healthier families and communities.